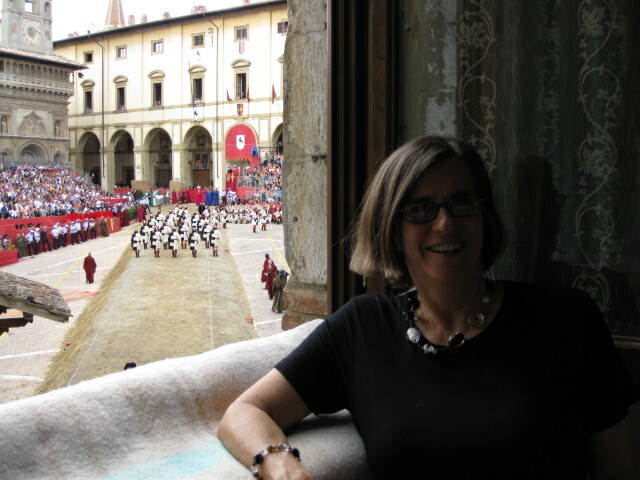 It’s Throwback Thursday, so I’m sharing a post from a previous blog about the Arezzo jousting festival in September of 2008. I arrived to an Arezzo abuzz with energy because it was the weekend of the annual jousting festival. 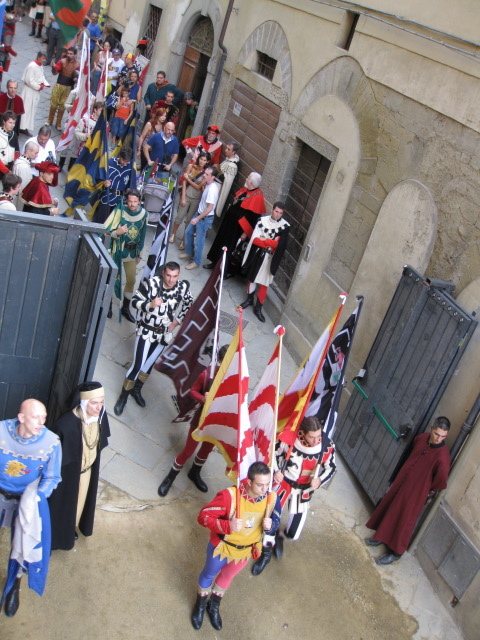 The town is divided into four quarters (or Quartiere), and each of the neighborhoods compete in a jousting tournament to earn the city’s Golden Lance. I joined my friends Marilyn and Bob, who had arrived a few days earlier. 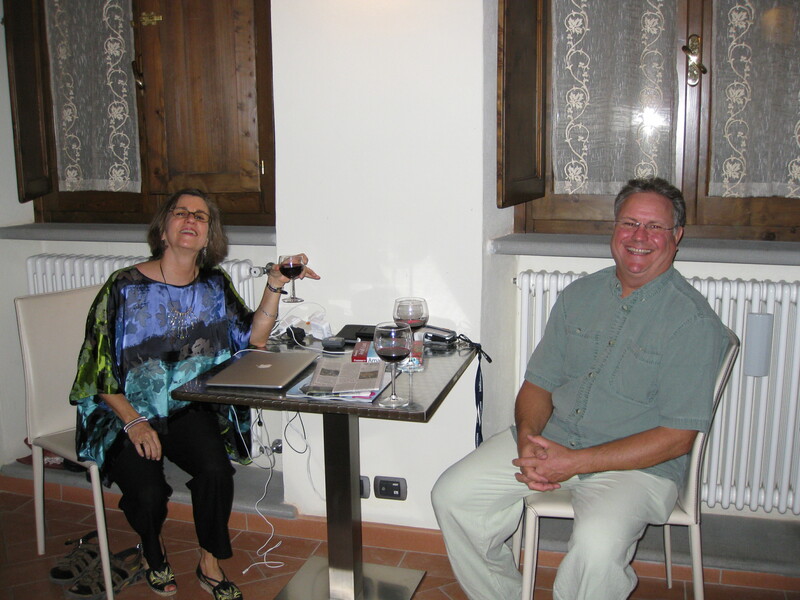 Marilyn was taking Italian language classes, so Bob and I have concocted plans to take a side trip to Bologna, while Marilyn attends scuola, and then the following week the plan is to travel to the Amalfi Coast to spend a week with more friends to celebrate Bob’s big birthday. Enjoying some vino before dinner. Bob and Marilyn rented a great apartment overlooking the Piazza Grande where the jousting festival will take place, so I met them there and then we ventured out to have dinner with the locals in their Quartiere, which is named Porta Crucifera (roughly translated: Gate of the Crucifix or Cross). The dinner was held in a small square near Bob and Marilyn’s apartment. Long tables were set up and everyone ate communal style. It was a lovely evening. The food was prepared by a grandmotherly lady and was delicious — mixed crostini, panzanella (bread salad), spinach cannelloni, and mixed grill of roast pork, pig’s liver (not my fave, but interesting) and rabbit (a local speciality). The next day, I shopped around town until I met up with my friends for an afternoon snack at a lovely cafe near the church of San Francesco. We had time to visit inside the church, which has beautiful frescoes painted by Piero della Francesca in the 1400s. View of the jousting from the apartment. It was time to return to Bob and Marilyn’s apartment on the Piazza Grande for the jousting festival which was set to begin at 5 pm. Our view was spectacular! Bob and Marilyn’s apartment gave us a great vantage point for viewing everything — the procession/parade that began the competition, the bands, the jousters, and the crowd. A jouster represents each Quartierre (neighborhood). The jouster charges a dummy which is at the end of a long track. The dummy is holding a target in one hand and a leather whip and leather and lead balls in the other hand. The jouster carries a long lance and tries to hit the target’s center. When he hits the dummy, it spins and the jouster has to avoid being hit by the whip and balls. Hello, paging Dr. Freud? Despite origins in the 1200s, the Arezzo competition was pretty high tech with sensors and cameras. Judges gave each jouster a score of 1 (bad) to 5 (excellent). Each jouster had two tries, and the jouster with the most points won. When a Quartierre gets a great score, their team and fans go nuts. If they got a bad score, the other teams went crazy. It was pretty intense. I captured the crowd’s reaction when one of the teams received the highest score. The event went on for almost two hours. Our Quartierre didn’t win, but we had a great time watching the whole event from our front row seats. This was like a trip back to Arezzo! How you say “flashback” in Italiano?? Hope you will do more!